This stunning Wisdom home situated in the Garden Gates Estate, has been designed for families that love to hang out together, but also has separate living areas when you really want your own space. 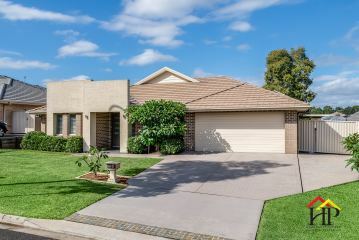 The property offers 4 good sized bedrooms, plus separate study, ensuite to main bedroom with double shower and double vanity, large open plan living and the bonus of a separate cinema room to enjoy movies with the family, or to hide the kids toys. The impressive kitchen is a chefs delight with it's 900mm oven and generous bench and cupboard space and it is perfectly positioned, so that it is sure to be the gathering point for family and friends as you cook up your culinary delights. The entertainer will love the stacker doors opening out to the spacious pergola area, that overlooks the private yard, with loads of room for the kids and dogs to play and there is a remote double garage with bonus mud room and large side access for the boat or trailer. This truly special home is blessed with quality features throughout and really needs to be seen to be appreciated, so call 4647 3999 to arrange your inspection now. - 4 Bedrooms plus Study - Open Plan Living - Separate Cinema Room - Ensuite With Double Shower - Ducted Air - Plantation Shutters - Large Entertainment Area - Nice Big Yard - Remote Double Garage - Great Side Access ALL PROPERTIES ARE AVAILABLE TO INSPECT 7 DAYS A WEEK AND AS ADVERTISED Harrington Park Real Estate have in preparing this information used our best endeavours to ensure that the information contained herein is true and accurate. Prospective purchasers should make their own enquiries to verify the information contained herein.